'Scariest Car Crash' Woman: 'It Was Horrifying' : The Two-Way Wendy Cobb says she didn't scream because she was just so stunned. Her first thought after the accident? Thankfully, her children weren't in the car with her. 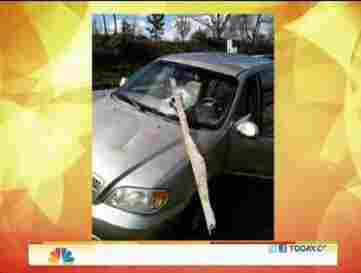 The North Carolina woman who thankfully wasn't injured when a piece of lumber came crashing through the windshield of her car — a frightening accident that you can watch, as we said yesterday, because she happened to be using her phone's camera at that moment — told NBC's Today Show this morning that "it was horrifying." Wendy Cobb says she saw the board coming at her. She was going about 45 mph at the time. Her first thought after getting out of her car was that thankfully her children weren't with her. Cobb also confirms that she was using the phone's camera because the vehicles in front of her were blocking other traffic and she was thinking she might want to report their actions to their employers. As for why she didn't scream when the board flew through the windshield, Cobb says "I don't know why, I don't remember. I'd just say a 'stunned silence,' maybe. It was horrifying." We noted yesterday that Cobb's video is truly frightening and that some folks may not want to watch. The Today Show report, which lasts a little more than 2 minutes, shows the moment of impact nine times. Consider yourself cautioned.